It is also called LAN and designed for small physical areas such as an office, group of buildings or a factory. LANs are used widely as it is easy to design and to troubleshoot. Personal computers and workstations are connected to each other through LANs. We can use different types of topologies through LAN, these are Star, Ring, Bus, Tree etc. 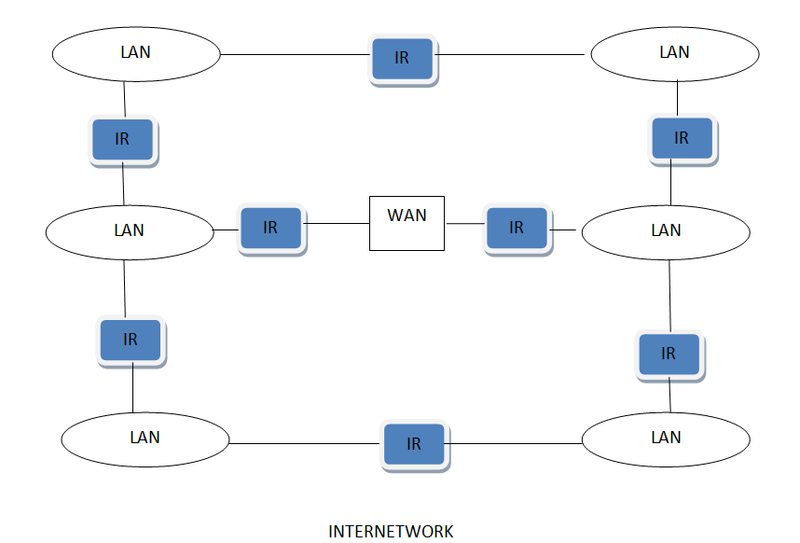 LAN can be a simple network like connecting two computers, to share files and network among each other while it can also be as complex as interconnecting an entire building. LAN networks are also widely used to share resources like printers, shared hard-drive etc. LAN's are private networks, not subject to tariffs or other regulatory controls. LAN's operate at relatively high speed when compared to the typical WAN. There are different types of Media Access Control methods in a LAN, the prominent ones are Ethernet, Token ring. It connects computers in a single building, block or campus, i.e. they work in a restricted geographical area. One of the computer in a network can become a server serving all the remaining computers called clients. Software can be stored on the server and it can be used by the remaining clients. Connecting Locally all the workstations in a building to let them communicate with each other locally without any internet access. Sharing common resources like printers etc are some common applications of LAN. Resource Sharing: Computer resources like printers, modems, DVD-ROM drives and hard disks can be shared with the help of local area networks. This reduces cost and hardware purchases. Software Applications Sharing: It is cheaper to use same software over network instead of purchasing separate licensed software for each client a network. Easy and Cheap Communication: Data and messages can easily be transferred over networked computers. Centralized Data: The data of all network users can be saved on hard disk of the server computer. This will help users to use any workstation in a network to access their data. Because data is not stored on workstations locally. Data Security: Since, data is stored on server computer centrally, it will be easy to manage data at only one place and the data will be more secure too. Internet Sharing: Local Area Network provides the facility to share a single internet connection among all the LAN users. In Net Cafes, single internet connection sharing system keeps the internet expenses cheaper. High Setup Cost: Although the LAN will save cost over time due to shared computer resources, but the initial setup costs of installing Local Area Networks is high. Privacy Violations: The LAN administrator has the rights to check personal data files of each and every LAN user. Moreover he can check the internet history and computer use history of the LAN user. Data Security Threat: Unauthorised users can access important data of an organization if centralized data repository is not secured properly by the LAN administrator. LAN Maintenance Job: Local Area Network requires a LAN Administrator because, there are problems of software installations or hardware failures or cable disturbances in Local Area Network. A LAN Administrator is needed at this full time job. Covers Limited Area: Local Area Network covers a small area like one office, one building or a group of nearby buildings. It was developed in 1980s.It is basically a bigger version of LAN. It is also called MAN and uses the similar technology as LAN. It is designed to extend over the entire city. It can be means to connecting a number of LANs into a larger network or it can be a single cable. It is mainly hold and operated by single private company or a public company. Communication medium used for MAN are optical fibers, cables etc. Data rates adequate for distributed computing applications. Extremely efficient and provide fast communication via high-speed carriers, such as fibre optic cables. It provides a good back bone for large network and provides greater access to WANs. The dual bus used in MAN helps the transmission of data in both directions simultaneously. A MAN usually encompasses several blocks of a city or an entire city. More cable required for a MAN connection from one place to another. It is difficult to make the system secure from hackers and industrial espionage(spying) graphical regions. It is also called WAN. WAN can be private or it can be public leased network. It is used for the network that covers large distance such as cover states of a country. It is not easy to design and maintain. Communication medium used by WAN are PSTN or Satellite links. WAN operates on low data rates. It generally covers large distances(states, countries, continents). Communication medium used are satellite, public telephone networks which are connected by routers. Covers a large geographical area so long distance business can connect on the one network. Shares software and resources with connecting workstations. Messages can be sent very quickly to anyone else on the network. These messages can have picture, sounds or data included with them(called attachments). Expensive things(such as printers or phone lines to the internet) can be shared by all the computers on the network without having to buy a different peripheral for each computer. Need a good firewall to restrict outsiders from entering and disrupting the network. Setting up a network can be an expensive, slow and complicated. The bigger the network the more expensive it is. Digital wireless communication is not a new idea. Earlier, Morse code was used to implement wireless networks. Modern digital wireless systems have better performance, but the basic idea is the same. System interconnection is all about interconnecting the components of a computer using short-range radio. Some companies got together to design a short-range wireless network called Bluetooth to connect various components such as monitor, keyboard, mouse and printer, to the main unit, without wires. Bluetooth also allows digital cameras, headsets, scanners and other devices to connect to a computer by merely being brought within range. In simplest form, system interconnection networks use the master-slave concept. The system unit is normally the master, talking to the mouse, keyboard, etc. as slaves. These are the systems in which every computer has a radio modem and antenna with which it can communicate with other systems. Wireless LANs are becoming increasingly common in small offices and homes, where installing Ethernet is considered too much trouble. There is a standard for wireless LANs called IEEE 802.11, which most systems implement and which is becoming very widespread. 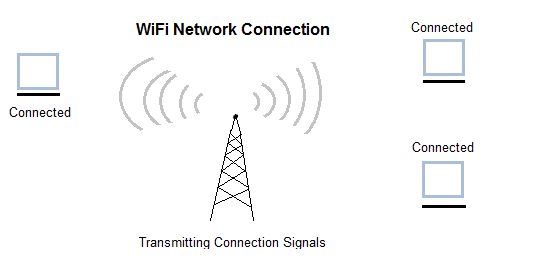 The radio network used for cellular telephones is an example of a low-bandwidth wireless WAN. This system has already gone through three generations. The first generation was analog and for voice only. The second generation was digital and for voice only. The third generation is digital and is for both voice and data. Inter Network or Internet is a combination of two or more networks. Inter network can be formed by joining two or more individual networks by means of various devices such as routers, gateways and bridges.